If you were ever stuck on a deserted island, you’d likely die a torturous death by heat stroke or starvation. Yet for some reason, we love to consider the occasion, if only to list what facile entertainments would most distract us from our inevitable demise. Let this serve, then, as an endorsement I hope you never have to heed: If you are hours from death, lying on the hot sands of some unnamed island nation hundreds of miles from civilization, you could do much worse than sinking that time into Super Mario Maker for Nintendo 3DS. Last year I played Super Mario Maker on Wii U for dozens of hours. After an initial burst of stage creation I found myself playing more often than making. 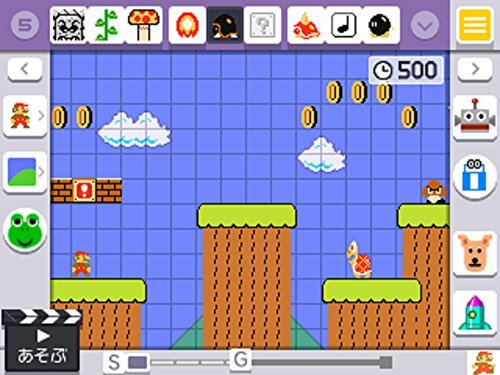 On the console version, there is an ever-replenishing reservoir of user-created levels; players can give levels stars and feedback, the accumulation of which help single out courses that the software then suggests. You can also search by User or Friend, and eventually a fairly robust companion site launched allowing players to fine-tune their search even more and then save these courses for future play. Log in with your Nintendo Network ID and the queue even syncs up with the game itself. Voila: Dozens of levels await your next boot-up. For thirsty platformer fans, the original Super Mario Maker is a veritable firehose of Mario. The 3DS game narrows that hose considerably. You don’t get the ocean of content from players like you. Instead you get a curated array of stages already built in the Wii U game, selected for your portable gaming pleasure. Even with a cork in the geyser, there are more levels in this game than you could ever play. But if playing a scattershot collection of stages from an international cadre of amateur designers does not fill you with confidence, the veterans at Nintendo have made sure to buttress their fans’ random enthusiasms with a more streamlined sequence of levels from the pros. This new mode is called Super Mario Challenge. You play a series of four level worlds, ostensibly attempting to save Princess Peach once more. But the real point is to get to the flagpole while fulfilling some additional requirement. I’d call them boiled-down versions of Achievements or Trophies but they’re not linked to some platform-wide score. They’re more like pointed suggestions, or “challenges” in the game’s parlance, and in this player’s experience had a surprisingly robust impact on how I played each stage. One early challenge tasks you with completing the stage without pressing Left on the D-pad. At first the requirement seems feeble, obvious even: “How hard could that be?” the veteran Mario player’s brain wonders, considering a lifetime of charging to the right, a thumb unremittingly jammed on the run button. Then you begin racing toward the goal. A simple Koopa Troopa saunters across a floating platform of bricks. You jump but realize your trajectory is too shallow; the turtle’s steady pace and your descending body are seconds from collision. You readjust mid-air, tapping Left on the D-pad, and you fall safely to the ground. There is no siren noise, no giant cartoon X that flashes on the screen letting you know you’ve failed the optional challenge. Finish the course and you simply won’t earn the Medal Icon for that course. But if you’re playing the level with this extraneous goal in mind, just as you tap Left you understand what you’ve done, and the impulse is to stop immediately and start over, at which point in time you realize how many thousands or millions of times you readjust, tapping left to sway Mario’s momentum one block’s length this way or that, and the prospect of moving only to the right suddenly looms large as not the easy target you presumed but some unnatural action against which the body wills itself to fight. You try again and die, over and again, not because of some obstacle the game has put in your way but a mere suggestion the developer has planted in your own mind, one you can choose to follow or not. This simplest of motivations is oddly intoxicating; you’ve never really played a Mario level like this, with playground rules forcing your hand. The simple text caption—”defeat ten enemies using the Raccoon Tail,” or “finish the stage with exactly 265 seconds remaining,” or “keep the D-pad pressed to the right the entire time”—shines with the same siren call of that lonely coin, worth nil but enthralling enough to drag you away from safe and solid ground and suggest, through sparkle alone, that it might be a good idea to leap across that gaping chasm for the mere chance at its acquisition. More times than not, you fall and die in the attempt. More times than not, you return to that same chasm and leap again, now pushed by the previous failure, the collection of that single coin some imaginary rite of passage. Previous Super Mario games have often included hard-to-reach coins or other symbols in the physical landscape of each level to procure as reasons to go back in. Here, though, the carrot isn’t another shiny bauble to find tucked away behind fake furniture, but instead an ever-changing instruction to follow. The inclusion of these arbitrary medals is the best new feature of Super Mario Maker for Nintendo 3DS. Without them, you have one hundred fun new courses to complete. With them, your playthrough is imbued with a self-propelled smattering of mental dares. The two pop up everywhere. The bird, a self-proclaimed master level designer, speaks only in coo’s; his dialogue, parenthetically translated into English, is pretty aggressive for a rock dove with a Mario emblem attached to its chest. New to the 3DS game is a series of lessons, hosted by Yamamura, that help teach you to make better, more interesting 2D Mario levels. The chatter that follows each completed Challenge world is similarly tuned to help you think more carefully about what makes a good level and how to make use of the newly acquired items. But there’s also plenty of daft back-and-forth for pure funsies—the two’s combative chiding reminds me of another 3DS game’s talkative anthropomorphic host: Rusty Slugger from Rusty’s Real Deal Baseball. Nintendo are quietly becoming the go-to source for morose wit where you least expect it. And after all this time, I’ve barely mentioned the “Mario Maker”-ness of a title all about making Mario’s. The ease and utility of the provided tools remain from the Wii U game, as do the clever transformations that occur when you “shake” an object with the stylus. For a more in-depth look at the charm and difficulty of making Mario, I point you to our games editor’s review from last September. The song largely remains the same. But in some ways, this 3DS version is a direct response to two points he, and others, made last fall. “Making Mario is tough,” our editor writes, “and the game itself doesn’t go out of its way to make it easier.” Cue this version’s twenty-step Lessons Mode with sample courses and explanatory notes. And the other big problem? Nobody knew quite what they were doing just yet. The Wii U’s early collection of user-made levels were a mish-mash of Auto-Scrolling Rube Goldberg Machines and makeshift theme songs using the in-game Note Block item to peck out crude melodies. By the time Nintendo collated this 3DS game, they had a year’s worth of work from the most inspired creators. Perhaps what many see as a lacking feature (the inability to download new user’s levels or upload your own) is in fact a measure of quality control. If you’ve messed about on the Wii U game and simply need to make 2D Mario Levels on the bus or in your bathroom, the 3DS version fits the bill. Otherwise, you’ve seen most of this circus before. 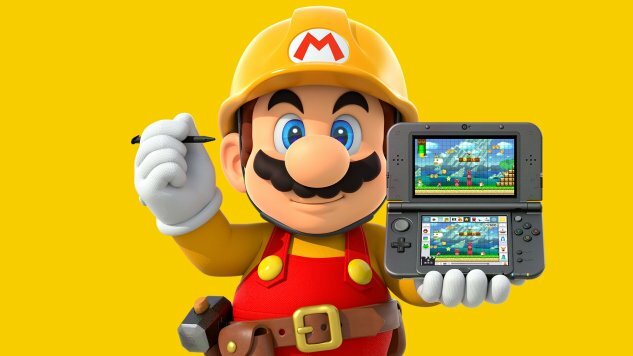 If, however, you have never participated in the glory that is mucking about in an interactive toolkit for one of gaming’s most revered franchises, Super Mario Maker on 3DS becomes something like an essential backpack, or deserted island, companion. Long may you run. Super Mario Maker for Nintendo 3DS was developed and published by Nintendo. It’s available for the 3DS.